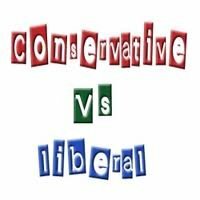 12 ATTRIBUTES SEPARATING LIBERALS AND CONSERVATIVES « THE BRYCE IS RIGHT! – How can we be so different? There is no doubt there are significant differences between the ideologies of the Liberal Left and Conservative Right. We are a nation divided by two distinctly separate interpretations of who we are and the direction our country should be moving towards. I have narrowed it down to twelve distinct attributes discerning our differences. Some will accuse me of oversimplification, but I think they will readily understand what I’m trying to say. LEFT: Socialists – believes the rights of the community supersedes those of the individual. No success or failure. Wants to redistribute the wealth. RIGHT: Capitalists – believes in individual initiative, risk and the freedom to try. The individual should keep what he makes. LEFT: God jeering – many agnostics and atheists determined to remove God from our lives. RIGHT: God fearing – most believe in a supreme being and govern their lives by religious morals. LEFT: Entitlements – assumes no responsibility; believes they have a right to something even if they didn’t earn it. RIGHT: Responsibility – assumes both credit and blame for personal actions. LEFT: Breaking the law to suit their agenda is considered acceptable. RIGHT: Respect for the rule of law. LEFT: Believes the Constitution no longer serves the needs of society and should be replaced. RIGHT: Believes in the U.S. Constitution. LEFT: Believes guns are dangerous and should be banned. RIGHT: Advocates the 2nd Amendment of the U.S. Constitution. LEFT: Credit card mentality; wants to keep raising the debt ceiling as opposed to addressing the problem. RIGHT: Believes we owe it to future generations not to burden them with an insurmountable debt. LEFT: Balancing the budget is immaterial. Keeps raising spending and lowering income. RIGHT: Wants to balance the budget and live within our means. LEFT: The public should be treated like cattle. Government will do the thinking for them. RIGHT: Respects the dignity of the individual human spirit and the importance of each person to lead a worthy and productive life. LEFT: Believes a larger government is needed to regulate everything. RIGHT: Believes in smaller government, thereby less bureaucratic interference with business. LEFT: Wants to make us ashamed of our past by rewriting the history books, and eliminating our sense of exceptionalism. RIGHT: Loves country; believes in exceptionalism. It is like we live in separate countries with little compatibility between the two. Whoever wins the presidential election in November, the other side is certainly not going to like it. NEXT UP: HAVING A BAD DAY – Thank heaven it doesn’t occur often. LAST TIME: THE WORD “GOBBLEDYGOOK” – Cheap words and expressions that bother me. Listen to Tim on WJTN-AM (News Talk 1240) “The Town Square” with host John Siggins (Mon, Wed, Fri, 12:30-3:00pm Eastern); WZIG-FM (104.1) in Palm Harbor,FL; KIT-AM (1280) in Yakima, Washington “The Morning News” with hosts Dave Ettl & Lance Tormey (weekdays. 6:00-9:00am Pacific); and WWBA-AM (News Talk Florida 820). Or tune-in to Tim’s channel on YouTube. This entry was posted on March 30, 2016 at 6:00 am	and is filed under Politics. Tagged: 12 ATTRIBUTES SEPARATING LIBERALS AND CONSERVATIVES, Florida, palm harbor, The Bryce is Right, tim bryce. You can follow any responses to this entry through the RSS 2.0 feed. You can leave a response, or trackback from your own site. I believe this is a very narrow minded view that doesen’t account for the fact that each individual lives on a spectrum somewhere between your two extremes in each category. And it’s partially views like this, that things are so black and white, that continues to divide us rather than trying to focus on the many things that most of us agree upon that can unite us. So what views do liberals and conservatives share that unite us? Inquiring minds want to know.